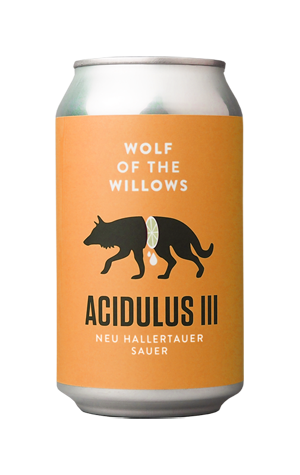 Wolf Of The Willows' love of language continues into the third beer in their Acidulus series. The beer's star ingredients are newly developed hop varieties out of Germany – Herkules, Hüll Melon and Hallertau Blanc – so, with the beer soured with lactobacillus, it's been tagged a "Neu Hallertauer Sauer". What's more, even the collaborative aspect of the beer – it was brewed with input from Berlin based, Aussie-American brewing couple Cristal Peck and Richie Hodges – is described as "hosting", a reference to the couple's Parasite Produktions handle. The Wolf Of The Willows team was keen to elicit as much information from their German co-conspirators surrounding the character of these new hop varieties; Parasite was the first brewer to use Herkules, designed as a bittering hop, for dry-hopping, for example. The outcome saw the beer "massively dry-hopped during fermentation", resulting in the most serpentine Acidulus to date, with the hops serving up aromas and flavours including, but not limited to, melon, overripe pineapple and grapes. There's a relatively potent and grassy bitterness and a touch of funk to be found alongside the broad acid base in this complex exploration of beer's schöne neue Welt.